Here is my travel journal from my trip to England, researching The King’s Rose. I went to London and experience history on a different, more physical level. I wanted to walk the garden paths that Catherine walked, visit the halls where she danced, and stand in the place where she was condemned. We began our trip by visiting with friends, Hazel and Roy, in Chesham, who were kind enough to welcome us into their home. However, we took some bad weather with us from Boston. 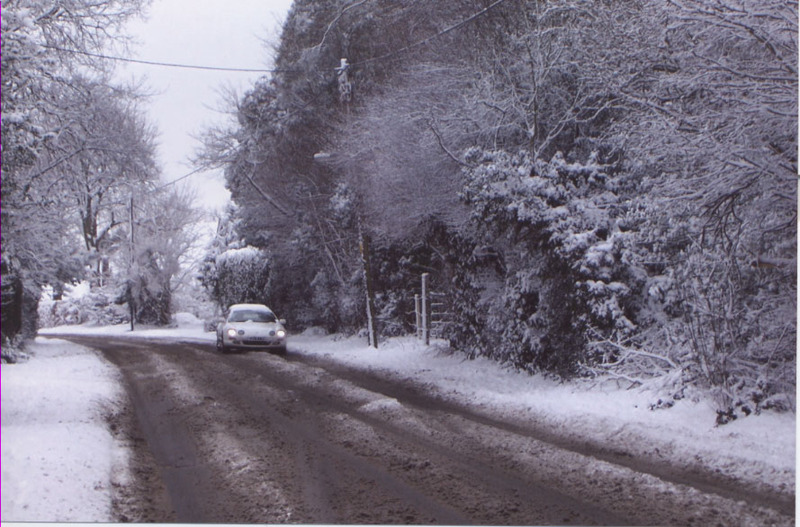 When we woke up from our jet lag-induced slumber, Chesham was covered in more snow than they had seen in a long time. Tom helped Roy shovel his driveway (though the implements at hand were short-handled garden shovels and a broom). The British National Archive has the letter that was purportedly written by Catherine to her lover, Thomas Culpeper, while she was married to the king. Unfortunately, the letter was in storage during our visit. To view the letter and read the transcript, visit http://www.nationalarchives.gov.uk/museum/item.asp?item_id=13. I did get to look at a registry of the queen’s wardrobe from 1543. Dated just over a year after Catherine’s execution, this was recorded during the reign of King Henry’s sixth and final wife, Catherine Parr. The handwriting was beautiful and precise, and the paper felt like fine linen beneath my fingertips. It occured to me that Catherine Howard was likely not well educated enough to write like this, but those serving her were—a cunning, intelligent lot, good actors who knew when to coddle and praise and when to condemn. After the archive we went into the city and found Lambeth Palace, a stately red brick building on the Thames. This is still a private residence, where Catherine lived with her step-grandmother, the Dowager Duchess of Norfolk, before being sent to court as a lady-in-waiting in the queen’s household. In the walls of this building, upstairs in the maiden’s chamber, Catherine and her companions carried out their scandalous midnight parties. At Windsor I came face to face with Henry’s suit of armor, built in 1540, the year he married Catherine. Here was the shell of the huge, hulking man, intimidating both in power and stature. Catherine has been described as petite, and at over six feet Henry was exceptionally tall for the time period—not to mention overweight by that point in his life. How did Catherine feel while standing next to him? Overwhelmed? Overshadowed? Protected, or afraid?